Kyrgyzstan's cash-strapped government wants to renegotiate its agreement with its largest foreign investor, Toronto-based Centerra Gold, and to end the company's privileged tax regime, Economics Minister Temir Sariyev said Monday, RIA Novosti reported. His comments came after the Kyrgyz Cabinet of Ministers approved recommendations by a state commission on Friday to cancel Centerra's existing contract for the high-altitude Kumtor gold mine and charge the company higher taxes. "Taxes must be paid on the basis of the country's tax code rather than some other agreements. 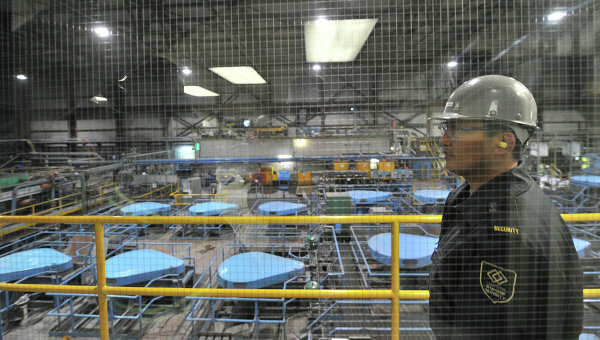 The existing agreement signed in 2009 stipulates special terms of operation and tax payments for Kumtor," Sariyev said. Centerra currently pays a 13 percent tax on its gross revenue and another 1 percent into a special fund for the development of the Issyk Kul Region, where Kumtor is based. The minister said other enterprises pay 17-20 percent and are demanding comparable terms. Centerra's management has said it may turn to international arbitration if the Kyrgyz government refuses to honor existing legal guarantees. The state commission also said it had exposed violations of the country's environmental legislation, and the Cabinet of Ministers is seeking damages totaling more than $140 million, largely a result of claims over the disposal of waste at the Kumtor site. Centerra has called the claims "exaggerated or without foundation" and said Kyrgyz officials approved the removals in question. The Kumtor gold mine is the largest in Central Asia and produced more than 8.4 million ounces of gold between 1997 and the end of 2011, according to Centerra's website. Under the 2009 agreement, the Kyrgyz government acquired one-third of Centerra. Centerra's subsidiary, Kumtor Operating Company, is the largest revenue earner for the Kyrgyz budget. In 2011, it accounted for 12 percent of Kyrgyzstan's GDP and over half its industrial output, according to government statistics; last year, those figures dropped to 6.6 percent and 37.9 percent, respectively, due to damaging work stoppages at the mine, which dragged down the entire economy. Meanwhile, Prime Minister Zhantoro Satybaldiyev said Monday that the agreement with Centerra "was drawn up in the interests of certain groups, not [in the interests of] the country," as it was signed during the regime of former President Kurmanbek Bakiyev, who was ousted in 2010 during a popular uprising fueled by perceptions of corruption among his family and other senior officials. "The issue of Kumtor can be normalized only at the moment the investor starts working in strict compliance with the republic's legislation," Satybaldiyev said in a statement circulated by his office. The latest battle over the terms of Centerra's work in Kyrgyzstan is far from the first. The 2009 agreement itself resulted from a forced renegotiation of a 2004 contract signed under the president who preceded Bakiyev, Askar Akayev.